Anything less than this would be an affront to the unwritten laws of the NES era’s film-to-game process. And that’s probably why even the Internet doesn’t seem to remember the actual Major League game released by Irem in 1989 for the Famicom (the Japanese equivalent to the NES). Irem’s Major League fails not only at adapting its movie inspiration, but also at capturing the alluring zaniness that pervaded many of the system’s film adaptations. Google searches bring up precious little info about the Japan-only release tied to its raunchy baseball comedy namesake. Emblazoned with the same super-cool mohawk and sunglasses-wearing baseball from the movie poster, the game’s box makes grand promises. “That best comedy Baseball movie is here translated into a family computer game!” it assures players. “Hot fights among 14 teams from the U.S. major leagues and Japanese leagues!” That sounds pretty good. “Many synthesizing IC’s make you feel as if you were really in the stadium,” it continues. What the hell are synthesizing ICs? Who cares! Bring on the hot fights. There are no hot fights. Once the game gets past some colorful menu screens with chubby cartoon versions of Sheen, Berenger, and what looks like an anthropomorphized version of the poster logo, what’s left is a spare baseball simulation. Options include paying against the computer, a friend, or watching the computer play itself. There are indeed 14 teams, but it’s impossible to distinguish between them since the menu doesn’t give them names, just letters. The team portraits at the bottom don’t even change once a team is selected. After a little image of what seems to be Indians manager Lou from the film—looking like the much-missed James Gammon making a guest appearance on Dragon Ball—what little character there was drips right out. All that’s left is broken NES baseball that lacks the artistic and action merits of contemporaries like Bases Loaded and LJN’s Major League Baseball, both of which preceded Major League by a year. At least there’s nothing in the game that brushes up against the vaguely racist drawings in the instruction manual. 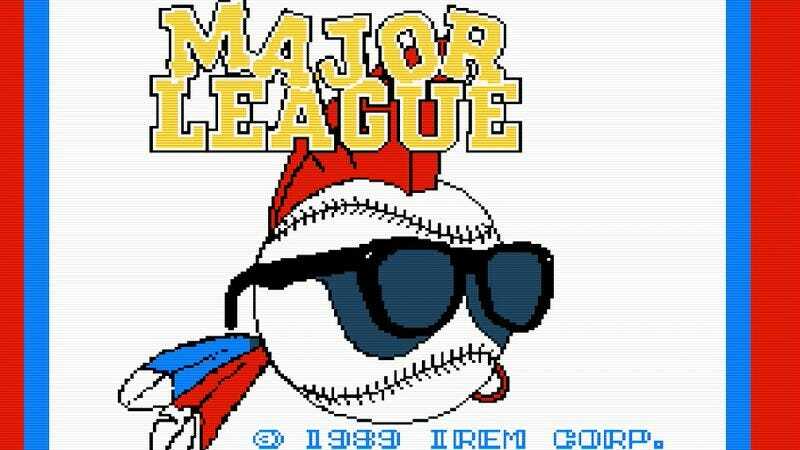 Then again, part of the magic in that particular era of game design is that stuff like Major League was actually perfect fodder for an NES game, as long as the source material was ignored (which game studios were happy to do). First of all, the filthy aspects that HBO would no doubt tag as “adult content” never stopped other game makers from adapting movies for the NES, and not just violent sci-fi like RoboCop or horror schlock like A Nightmare On Elm Street. Platoon made it to the NES; if Nintendo Of America granted its precious seal of approval to that Charlie Sheen vehicle, Major League certainly could have made it past the censors, and hopefully in as equally odd a form. Major League’s tragedy isn’t really that it represents the movie badly, but that it doesn’t match the lunacy of its contemporaries. All NES movie adaptations, not just those aforementioned R-rated flicks, were terrible representations of their source material. Making games was an experimental process in 1989, even more so than today, when so many established formulas have proven successful. Couple that creative spirit with antiquated tech like the then 6-year-old Famicom, and developers had to be imaginative in how they brought movies to life as games. “Imaginative” is putting it gently, in fact. They had to get weird. How weird? On the NES, Marty McFly has to bludgeon ’50s greasers with milkshakes until they stop coming in Back To The Future. Batman has plenty of vignettes recreating scenes from Tim Burton’s ’89 feature, but Michael Keaton definitely never fought a jetpack-wearing robot at City Hall in that movie. At no point in Blues Brothers did John Belushi have to pick up wooden crates and hit people in the head with them while running (and he wasn’t in the best shape to do so if the script called for it). Transforming a recognizable movie into one more thing to sell is a mercenary act, certainly, but developers working on the NES almost always used the opportunity to probe new possibilities while working with limited time and money. Most adaptations were just as awful as Major League, despite their creative flair. LJN, the publisher behind both the screwy Back To The Future adaptation and the serviceable Major League Baseball mentioned earlier, churned out dozens of movie, cartoon, and comic book games between 1987 and 1995, and almost all of them were nightmares to play. Even at their worst, though, most were memorable. Jaws turned Spielberg’s thriller into a sort of hunting role-playing game that had players sailing around an archipelago, raising funds for gear to bring down a chunky version of the great white. Friday The 13th made Jason Voorhees into a purple hulk and threw impossibly random conditions on players, but it also bottles the “alone in the woods” disquiet that made the original movie so popular. The lack of standards created a strange creative freedom. Irem could have done almost anything with the Major League license. The Capcom-ian platforming antics of my fantasy Major League game is just one of many routes the developer might have taken in churning out a game to carry the movie’s name. Maybe it was a comedy sports game like Arch Rivals, full of jokey violence and big plays. Maybe it was an adventure where players had to travel around recruiting the team. Major League had boundless potential on the NES, since there were few expectations of what a video game could be on that machine, adaptation or not.